The advent of high operating temperature (HOT) sensors over these last five years has allowed the operating temperatures to increase up to 150°K. In this ointerview, AZoSensors talks to Jeff Leake of Sierra-Olympic Technologies Inc. about how this advancement in technology has led to the invention of the VENTUS™ OGI. Can you give a brief overview of Sierra-Olympic Technologies Inc., and what sets you apart from other members of your industry? We are both a manufacturer of infrared camera products, and a distributor of components in infrared technology. We craft specialized infrared imaging systems designed for commercial, military, government and OEM end-users. We support infrared camera and component technologies from the industry’s leading technology developers. Our services and products include optics, infrared camera components and engines, and specialized digital processing of infrared image data. Sierra-Olympic Technologies, Inc. was founded in 1995 as a sales representation firm for advanced, cooled infrared camera technologies developed by Amber, A Raytheon Company. The founders' experience dates back to the earliest commercially-available, cooled InSb cameras developed in the late 1980’s. In 2010, the company was acquired by Hood Technology Corporation of Hood River, OR. Can you please explain to our readers what a “Hot MWIR detector array” means and the theory behind it? Up until the last five years, mid-wavelength (MWIR) infrared focal plane array sensors historically required cryogenically cooling down to 77°K by the use of liquid nitrogen filled dewars or closed cycle stirling coolers. The advent of high operating temperature (HOT) sensors such as XBn (InAsSb), nBn (two n-type semiconductors sandwiching a barrier layer), SLS (strained layer superlattice) and Lead Selenide (PbSe) over these last five years has allowed the operating temperatures to increase up to 150°K. The benefits of increased operating temperature of these new High Operating Temperature (HOT) detectors allow the use of smaller, long life Sterling coolers which result in smaller, lighter and lower powered cameras commonly referred to as meeting SWaP (size, weight and power) requirements for integrating into airborne gimbal payloads or fixed mounted continuous monitoring systems. These developments are critical in applications such unmanned aerial and ground vehicles, portable handheld devices and even helmet mounted systems. Your new VENTUS™ OGI features an 8X electronic zoom, can you please explain to our readers the technology behind these exceptional zoom capabilities, and the industries that would benefit most from them? The VENTUS™ OGI camera offers 1X, 2X 4X and 8X digital zoom. The importance of digital zoom is provide greater stand-off distance for safety reasons and to image process equipment at further distances or in areas where there is insufficient ways to easily reach the equipment. How much smaller and lighter is the VENTUS™ OGI compared to other cameras on the market? Does this reduction is size and volume mean that performance is compromised? No it does not, in fact the Noise Equivalent Temperature Delta (NETD) with the narrow bandpass gas cold filter integrated into the closed cycle cooler and with the lens attached, is less than 28mK. Can you give an example of this, perhaps the VENTUS™ OGI’s pixel count or is field of view? 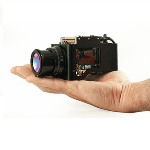 The resolution of the VENTUS™ OGI camera is 640 x 512 with a 15µm pixel pitch. The camera comes standard with an F/1.5, 25mm fixed focal length lens that is manually focusable and is optimized for hydrocarbon gas plume detection. The field of view with the 25mm lens is 21.7° HFOV x 17.5° VFOV. Are there any additional features of the VENTUS™ OGI? The VENTUS™ OGI camera features an integrated black body calibration flag to assure the best possible imagery at all times, 14-bit digital camera link interface, NTSC RS-170 or PAL analog video output, RS-422 serial communications, along with local area image processing with dynamic contrast enhancement, noise reduction filter, foreground and background image boost enhancement, automatic gain and level control, multiple color palettes on analog video output, invert and revert polarity, multiple regions of interest, linear and histogram AGC/ALC, manual gain and level control. The VENTUS™ OGI camera is also OOOOa Certified. Which industries will benefit most from the VENTUS™ OGI? Oil and Gas/Energy related Industries. The VENTUS™ OGI camera core is idea for integration into fixed mounted continuous process monitoring systems and for manned and unmanned aerial drone platforms. Additional applications include; pipe racks, gathering and transmission lines, above and below ground gas pipelines, fuel gas lines, valves, flanges, connections, seals, vent stacks, compressors, storage tanks, LNG terminals, flare stack monitoring of burned and unspent gas, generators, tank farms, drilling and production wells, booster/pump stations, first responders in emergencies after major disasters, storage/container areas on barges and ships, terminals, engines, and railroad tank cars. What’s next for Sierra-Olympic Technologies Inc.? Consistent dedication to advancing technologies, exportable EAR products, and custom development of camera engines for a wide range of applications. Jeff Leake is the VP of Sales and Marketing for Sierra Olympic Technologies based in Hood River, OR. He has been in business development positions for 34 years in the infrared imaging industry and has been directly involved in the development and use of optical gas imaging cameras systems for the past 19 years.